1. Soak 3/4 cup of quinoa for 15-20 mins. Drain well. 2. 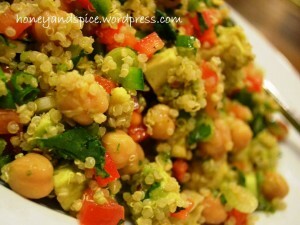 Place the quinoa, peppers, avocados, tomatoes, beans, spring (green) onions into a very large bowl. 3. In a small bowl, whisk together the dressing ingredients – olive oil, lime juice, garlic, oregano, cumin, jalapeno, coriander (cilantro) and season to taste. 4. Gently toss the salad with the dressing, adjust the seasoning if required and serve, enjoy!